This New Year’s Highfliers Clinic are designed to give sailors in full time education quality sailing time over the New Year holidays. The Highfliers Clinic will also provide young sailors with the opportunity to be coached by the most experienced Laser coaches available, including some national team coaches. The clinics daily schedule will combine classroom lessons with on the water exercises offering healthy competition and is followed up with debrief of tactical and strategy situations. Sailors will receive individual attention both on the water and with video analysis. The focus group of this Highfliers Clinic are boys and girls, who are in full time education and at their national sailing team level. However they have a need to balance study, while maintain their sailing level over the winter months. Arrive into Malta Airport between 08:00 hrs and 22:00hrs and be met by one of SailCoach’s friendly staff. 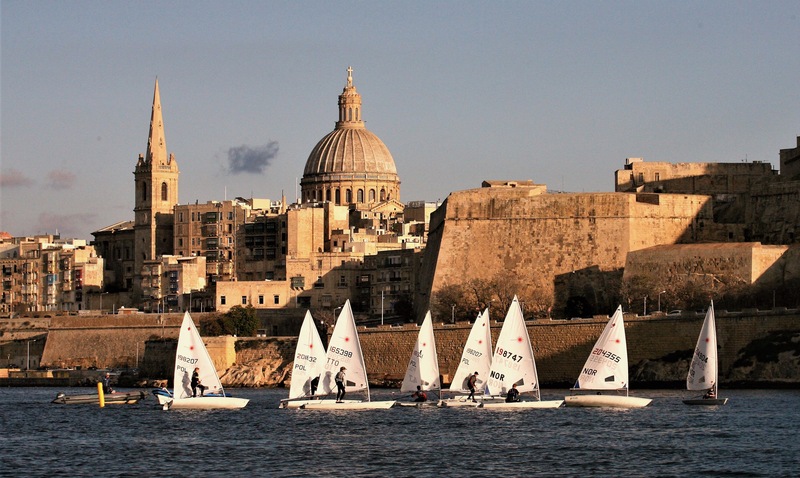 They will take you to the Royal Malta Yacht Club, the venue for this New Year’s Highfliers Clinic. The New Year’s Highfliers Clinic daily schedule will start each morning with a group briefing at 10:00hrs in the Royal Malta Yacht Club and finishing at 17:00hrs. (departure day) SailCoach staff will drop you off at Malta Airport between 08:00 hrs and 22:00hrs for your journey home after some quality training. For this New Year’s Highfliers Clinics which will take place at our Malta SailBase, at the Royal Malta Yacht Club, Ta Xbiex Seafront, between the 27th December (arrival day) and the 4th of January (departure day), we have put together a total package price including, accommodation with breakfast and evening meal included, airport transfers on our set arrival and departure dates from Malta Airport, fitness training, and our world class coaching. On top of this you would need to budget for flights, Laser charter, lunchtime meal and pocket money. We offer free airport transfers on the designated days, (transfers outside these days and times will cost €20).